During the month of October 2017, the Baha’is in some 100,000 localities around the world celebrated the Bicentenary of the Birth of Bahá’u’lláh, Prophet-Founder of the Baha’i Faith. 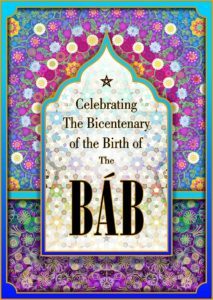 His forerunner, the Báb, born in 1819, although two years apart, the Báb was born on the day before the birth of Baha’u’llah according to the calendar used in Persia at that time. The celebration of the birth of these Divine Luminaries, whose lives and missions are so closely interwoven, are celebrated each year as part of a two day celebration called the Festival of the Twin Holy Birthdays. Light to the World This film takes you to villages and places around the globe as the people share how their encounter with the Revelation of Baha’u’llah has transformed the life of their communities by bringing about resilience, equality and unity. Vignettes on the life of Baha’u’llah are interspersed throughout. Bahá’u’lláh (1817-1892), claimed to be no less than the Messenger of God to the age of human maturity, the Bearer of a Divine Revelation that fulfills the promises made in earlier religions, and that will generate the spiritual nerves and sinews for the unification of the peoples of the world. His teachings, centered around the recognition of the oneness of humanity, offer a compelling vision of a future world united in justice, peace, and prosperity. Called by different names throughout the ages, the eternal God, the Creator of the universe, is limitless, all-knowing, all-powerful, and all-loving. God is one. The reality of God is beyond human understanding, though we may find expressions of God’s attributes in every created thing. Beyond all differences of culture, class or ethnicity, regardless of differences in customs, opinions or temperaments, every individual is a member of one gloriously diverse human family. Each unique soul has a role to play in carrying forward an ever-advancing material and spiritual civilization. Humanity’s spiritual, intellectual and moral capacities have been cultivated by the successive Founders of the world’s religions–the Manifestations of God—among them Abraham, Krishna, Zoroaster, Moses, Buddha, Jesus Christ, Muhammad, and most recently, the Báb and Bahá’u’lláh. Each religion originates from God and is suited to the age and place in which it is revealed. In essence, the religion of God is one and is progressively unfolding. Baha’is around the world, work with their friends and neighbors, including children and youth of their communities, to strengthen the foundation of society through programs that nurture spiritual growth and virtue development, foster amity and unity, and lead to joyful, purpose-oriented lives. These are grass roots, neighborhood-development programs focused on transformation, empowerment and service. People of all ages and backgrounds are invited to participate. A Rich Tapestry is a video storytelling series that expresses and illustrates how love is being translated into action to address questions of race and culture in the United States. This collection of video stories provides authentic examples of how individuals, communities and institutions are weaving together a rich tapestry of community life in neighborhoods across America. We hope that they spark conversations and help you to envision the wondrous possibilities of a community life that transcends differences of race and culture. The development of such communities is not only assured but is daily advancing. ●A Rich Tapestry: how issues of race and culture are being addressed through the work of building communities on a spiritual foundation. ●Refresh and Gladden My Spirit: how two women who came together through prayer built a relationship of shared service. ●It’s About Service: how one community’s youth service project brought together immigrants from various African countries who overcame cultural differences to serve. ●The Bahá’í World View: how the Faith’s core teaching of the oneness of humanity is being translated into reality through a framework of community-building activities. The collection will continue regularly to grow as we add new videos telling additional stories of efforts worthy of reflection. The writings of the Báb and Bahá’u’lláh are considered by Bahá’ís to have been revealed by God. As the creative Word of God, these sacred writings have the power to touch the deepest recesses of our hearts and transform us and the world around us. The Bahá’í writings address the needs of the age and offer inspiration for individuals working to better themselves and their communities. Bahá’u’lláh enjoined His followers to read daily from the Sacred Texts. Prayer, offered both in private and in the company of others, is regarded as essential spiritual nourishment, providing inspiration for positive personal and social change. As part of a private prayer practice the Baha’is choose one of three daily obligatory prayers. In the Baha’i Faith there are no sacraments and virtually no rituals. At devotional gatherings scripture may be read from the Baha’i sacred writings as well as other holy books such as the Bible and the Quran. Baha’is use the prayers revealed by the Báb, Bahá’u’lláh and ‘Abdu’l-Bahá. There is no congregational recitation of prayers unless the prayer has been put to music and is sung. Others may be invited to offer a prayer from their spiritual tradition as well. The affairs of the Bahá’í community are administered without clergy, through institutions, established by Bahá’u’lláh to foster universal participation and to diffuse knowledge, love, and unity. Non-partisan elections and collective decision-making are hallmarks of Bahá’í administration. The spiritual and administrative centre of the Bahá’í Faith and seat of the Universal House of Justice, is located in Haifa and Acre, Israel. Baha’is represent a cross-section of humanity, numbering over five million, from more than 2,112 different ethnic and tribal groups living in over 116,000 localities throughout the world. The Baha’i Faith is now recognized by the Encyclopædia Britannica as the second most widely spread independent religion in the world, after Christianity. The worldwide Bahá’í community may be the most diverse body of people on earth. It is among the world’s most unified organizations, which may be its most distinguishing characteristic: It functions as a world community united in vision and action with “unity in diversity” as its watchword. Find Baha’i Communities in Ohio and the continental U. S.